If yesterday's weather was perfect for running, today's was perfectly-awful. My Garmin, which somehow seems to know these things, reported 97% humidity during this morning's run. Today's planned speed workout had to be deferred in favor of a "git it done" neighborhood grind. When I stepped outside at 8:00 AM, I detected some slight rainfall - drizzle really - that I expected to stop. I expected this because my favorite News 12 weather woman said it would clear up and become a final day of summer beach day. I tend to believe her because she's a runner and therefore wouldn't mislead other runners. Well, it rained. I dealt with the ever steadier rain for the first mile that looped close enough to my house that I could have just gone home and finished my run on the treadmill. By then, the rain's intensity had dissipated and the sun was poking through. Soon there was no rain, but the enveloping humidity continued the unpleasantness. One the reasons I don't like running in rain is that it collects on my lenses and obscures my vision. 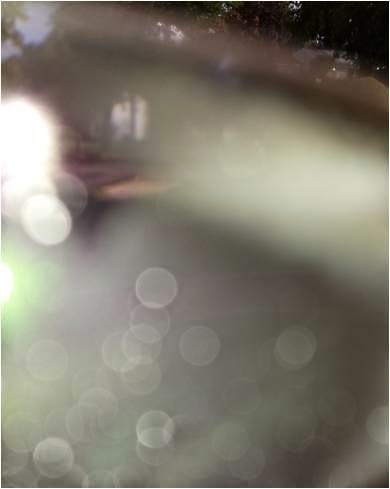 Humidity has its own way of doing that by fogging the lenses from the inside, rendering the world like a Gerhard Richter painting. When I tried to clear my lenses with the bottom of my sweat drenched running shirt, it just made it worse. As I ran, I thought about stopping and resuming later when the "beach day" weather arrived. I decided to tough it out, which was a good idea because the skies never cleared and the humidity never dropped. I had hoped that today would be the kickoff to a more focused approach to performance running. I really want to run - and race - with my buddies (see SIOR's Cow Harbor recap and the Petite Pacer's latest post). Before I can join them at the starting line, I'll need to find another minute per mile in my race pace.